There’s a place in Louisville that consists of tree lined streets, friendly residents and sidewalks on every street. It’s a place that is a central location to groceries, restaurants, local shops AND highways. 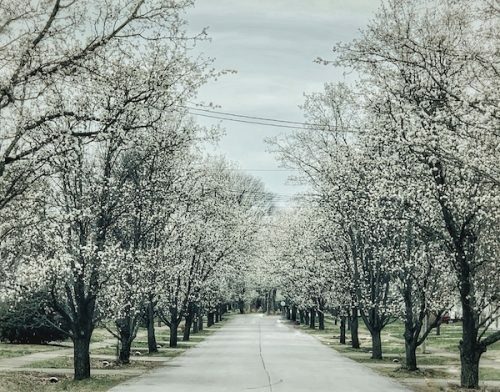 It’s a place that is beautiful during any season, but particularly Spring because the trees bloom flowers that look like snowflakes. This special place is the City of Wellington. The City of Wellington was established in 1946, consists of approximately 600 residents and 259 homes. This walkable neighborhood has so much character and history it’s no wonder it’s a well sought-after neighborhood. Are you looking for a neighborhood like the City of Wellington? Click here to view listings in the City of Wellington. Or if you want to see other communities in Louisville, click our Guides page to view homes available in other areas, or navigate our map search to see what’s available. Looking to sell your home? You can contact us to get your updated home value of your home.